Happy Thursday pretty ladies! I'm not going to lie, when I was younger I was horrible with my skin and hair care. I used the cheapest products, often forgot to take all of my makeup off, threw my hair in a ponytail when wet (using a rubber band)... pretty much everything you aren't supposed to do. If I could go back and tell my younger self to take better care of my skin and hair, I would in a heartbeat and we all know our mother's already told us this but of course we didn't listen! 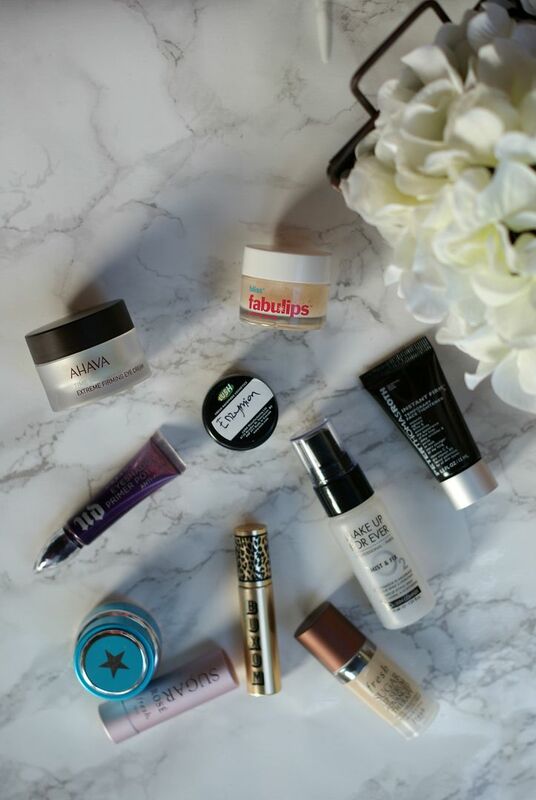 I know I can't be the only one who broke all the beauty rules growing up but I'm here to share with you some great must-have products that can not only help hide those fine lines and sun spots but also keep you looking younger. Let's start with skin prep. My life has completely changed after I bought my Clarisonic. There is a brush head for every skin type, lately I have been loving this one but if you're looking for the crème de la crème, this one is amazing! It really revitalizes your skin and evens out skin tone. I often rotate between facial cleansers as my skin is different in different times of the year. Usually my skin is a bit oily in the t-zone but it's also pretty sensitive. After cleansing a good moisturizer is a definite must. I used to think a moisturizer would make my skin even more oily so I'd shy away from using one but now I realize how important it is to keeping your skin fresh and wrinkle free. I've been using this lightweight one for the summer since it's perfect for these humid Florida days. I also recently tried this one and love that it's all natural and light. For hydrating my skin I've been using this and it really surprised me. I wasn't a fan of the Glam Glow original but this is extremely hydrating. I went back and forth on whether I thought a primer was necessary or not. Some I've found to be better than others (I mean, isn't that the case with anything?) but last weekend B introduced me to this primer and now I'm hooked. I was amazed at how great her skin looked (seriously though, that's mainly just good genetics and I'm totally jealous) but I loved how soft and smooth it was and it makes your makeup go on flawlessly. It's a bit on the expensive side but totally worth it if you're looking for a splurge. This eye shadow primer is the same one I have been using for years (I kid you not!) and even though they've changed the packaging (twice) I still keep coming back for it! Everyone has their own preference on make up they use. I'm not big on liquid foundations and I often go back and forth between mascaras and liquid eyeliner or kohl but one thing I can say is a setting spray is a life saver. I personally have been using this spray and I love it. But I know a lot people are huge fans of this one. Both got used in Charleston and both completely saved our makeup from sweating off in the crazy Charleston heat and humidity! I've been all about bold lipsticks lately and if you're going to wear a bold lip color, you need to exfoliate those lips. Especially if yours get as dry as mine do! I LOVE this lip scrub and have been using it for years now. It even tastes good... is that weird? My go to lipsticks have been MAC lately due to their pigmented and gorgeous colors but on days when I don't want to wear lipstick I love this Fresh Lip Balm. It adds a hint of color and has SPF 15! Whew. That was a lot more than I intended to write but when you find great products you just want to share them with everyone! 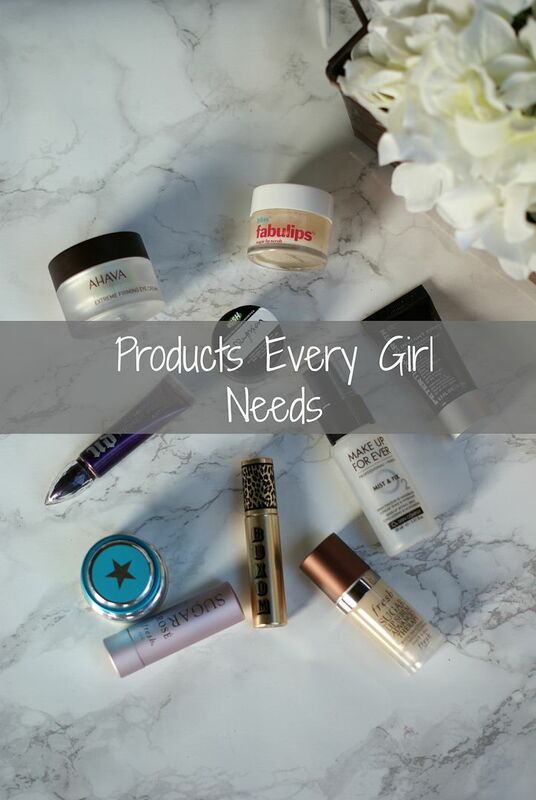 Have you found any must have beauty products? If so let me know what you can't live without, I'm always looking to try out new things! Clarisonic is where it's at, right? We are too old for the cheap imitations now, it's time to use the real thing because it works so much better. My skin is so much softer when I use my Clarisonic. And I love SUGAR lip balms, so fun! I feel like every year I add another round of products into my regimen but they really help don't they? The sugar fresh lip balms are the best. I love stocking up on those around the holidays with Sephora. That Urban Decay eye primer is everything! 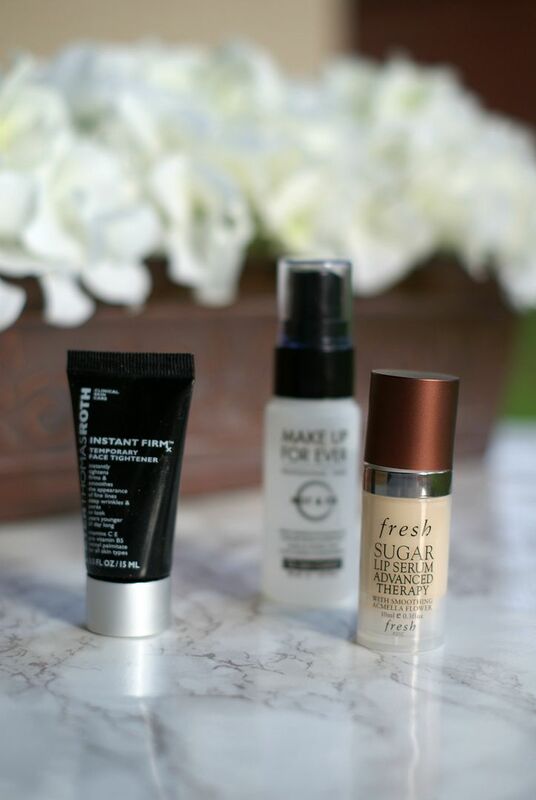 I need to get on trying a few of these other products (like the face primer and setting spray) because I keep hearing so many good things! I moved to wearing mainly liquid eyeliner a few years ago and I've been really missing the kohl look lately!! Dying for a Clarisonic… asking for one for my birthday!! I've also never used a lip scrub but I've been really wanting to lately. Purchasing this asap! 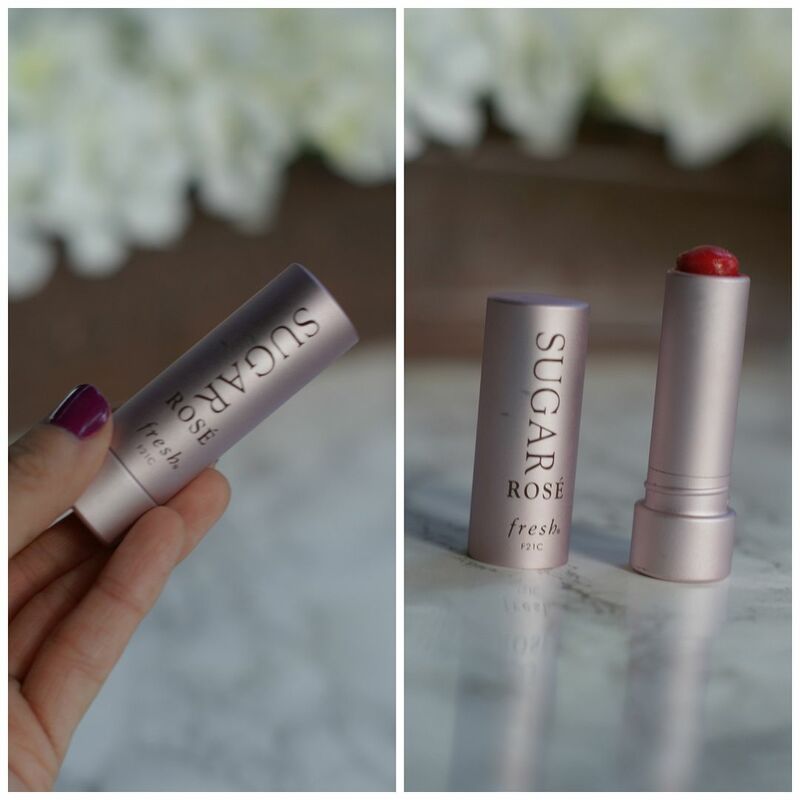 The sugar lip balm is really nice--I love using it! I haven't used any of the other items on your list, which just means that I need to find some money to get it all haha. If I trust anyone on beauty products, it would be someone like you who always looks awesome! I've heard great things about the Clarisonic! Thanks for the lip scrub recommendation, I've been thinking about getting one. I have mild eczema on my lips and that might help smooth it when it starts to act up. Skincare is so, so important! I LOVE the moisturizing Glam Glow- hello, hydration! Love beauty posts! The Clarisonic changed my life, too. I know how dramatic that sounds haha but seriously! I couldn't live without it now! That primer sounds like heaven, too - I may have to pick up a sample before I splurge! FRESH is one of my favorites! 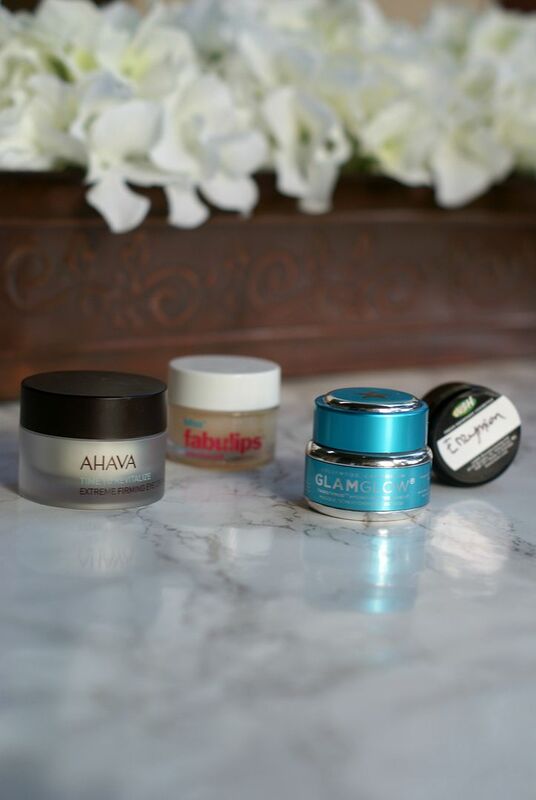 I always have it in my bag when I'm traveling as it keeps my lips extra moisturized! I've found primers definitely make a difference for me. Looks like I have some new beauty products to investigate! That is the best Glam Glow by FAR! And the smell... to die for! I need to try that lip balm and I've been hearing so much about Glam Glow, I probably need to do it! I definitely need to give some of these a try! Especially the Glam GLow! 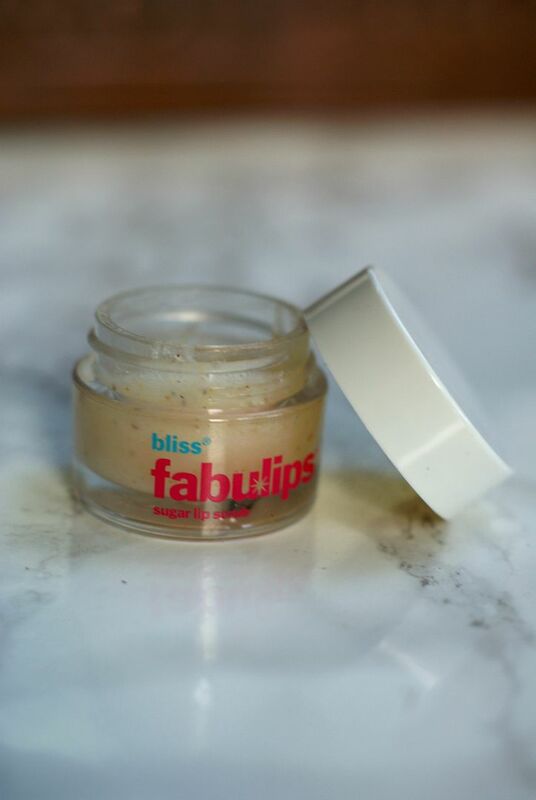 You included two of my favorite things, Bliss fabulips and Fresh lip balm. I am obsessed with both! Great post! I totally need that clarisonic!! Especially after what the hormones this pregnancy have done to my skin, yikes! I'll need help from my derm as well but evening out my skin tone is #1 on my list! When I was younger I was the worst with skin care as well! I need to check out the Clarasonic. OK I'm the "younger you" doing all the things wrong with bad skincare ... except I'm 32!!!! Is it too late?! Haha ... I keep eyeing the Clarisonic, I think I need to take the plunge!!! I love a products post! I definitely need a lip scrub! I'm in definite need of upping the products I use. It's starting to sink in more and more that the cheap stuff is just not going to cut it forever. Primer is one thing I REALLY need to get into. My makeup lasts like a couple hours and then it's gone. I think adding a primer (and setting spray) would definitely help! The Enzymion Moisturizer sounds awesome! I haven't tried any of these products except the UD primer. Lip scrub? I've never used one in my life. Wow I've been under a rock clearly. woah, you're not supposed to put your hair up wet? oops. I got a mini Sugar balm and a mini tinted Sugar balm as my Sephora birthday gift a few years ago! They are sooo smooth! I LOVE them! Your pictures are all so good! I need to start using my clarisonic again- I needed new brush heads and was lazy and never bought them so I just stopped using it. And I need to find a good lip scrub- that's one thing I've never really used! I've been wanting to try one of those fresh balms! They look pretty. I love reading about other girl's beauty routines! xo Have a great weekend! I keep tellin gmyself I am going to pick up a sugar lip product and never do. I really need to get on that! That Lotus lotion stuff is a great price point! I may look in to that too! My skin has been awful lately. This was a fantastic post, girlfriend! I've been looking for a face primer for my cousins upcoming wedding, so I'll definitely look into the one that you mentioned. I don't use it daily, so even if it's expensive it should last a while! Love my clarisonic, but I definitely need to find a good moisturizer. I really want to try out some of the Lush products. Love this post, girl! Who Doesn't Love A Good Sale?